Remember those husband-wife mystery shows McMillan and Wife, and Hart to Hart? Those shows had little to offer in terms of plot line, but the thing that made them such big hits during their time was the comic chemistry that went on between the married couple. Their back and forth banter would have the networks laughing all the way to the bank. 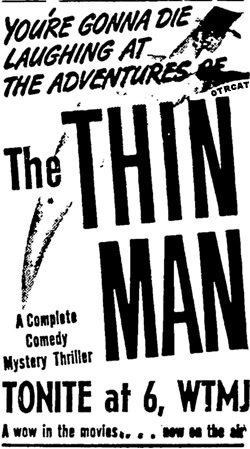 Those networks should thank Dashiell Hammett (see also Fat Man), the creator of The Thin Man. The old time radio show was actually spun from the very popular detective novel by Dashiell Hammett , writer of The Maltese Falcon and The Glass Key. The subsequent movie, by the same name, was a very low-budget MGM film that was filmed in only 14 days, went on to gross over $2 million while being nominated in four categories for Academy Awards: Best Picture, Best Actor, Best Director, and Best Adapted Screenplay! For more brainy detectives, see also: Softboiled Detectives. This collection is also included in the Dashiell Hammett Collection. 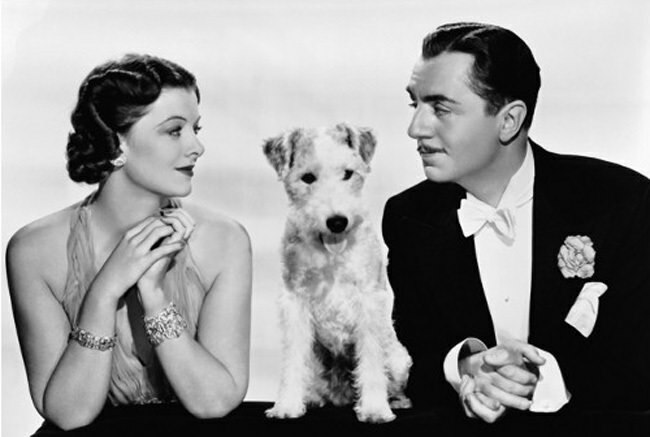 Be the first to comment on "Thin Man"